The Promise should be posted for girls who don’t know it by heart. Girl Scouts has developed a series of blog posts for parents on raising awesome girls. I was particularly impressed with this one: Yes, Your Daughter Just Called Herself Fat Some of the advice would also be good for a leader who has a girl who uses the word “fat” to describe herself at a meeting. Our first inclination to to say something like “no your not” (whether or not she is) or to say “your beautiful” (as if the two are mutually exclusive). As Guide leaders we can emphasis that all bodies are good bodies no matter what their shape. This video contains some great easy to do physics experiments that all use static electricity. Most are really low prep too which isn’t always the case with physics. There’s a Place for You in Engineering! 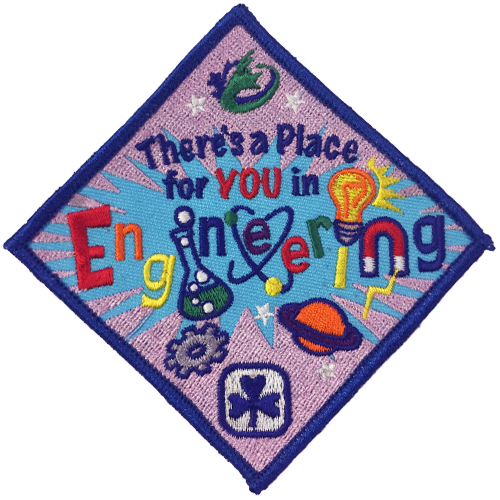 Engineers Canada has developed and released a Girl Guides crest, to be presented to Girl Guides who complete engineering-related activities under the supervision of a professional engineer or an engineer-in-training. These activities—such as those that present an understanding of how vehicles work, the concept of simple machines, how lipstick is made, to name just a few—expose young girls to the engineering that can be found in everyday life and give them an understanding of how the world around them works. Anyone interested in using the crest can contact Engineers Canada to confirm conditions of use and order required quantities. If you have an engineer coming into your meeting to do a presentation to the girls, you may want to inquire about the crest. Contact information in on the Engaging Girls page. Another easy and fun way to make candles is to make sand candles. You uses wet sand to make the mold. You can even decorate the candles with small shells or rocks. Once the wax is cooled you can either brush the sand off or leave it there as a decoration. This Instructable gives great instructions for making candles using a shell as the mold. Two slices of white bread with lemon pie filling and marshmallows toasted over the fire in a pie iron. Half a pita with a pie filling such as apple, blueberry or cherry spread inside. Wrap in foil and toast over the fire. After you remove it, add wiped cream before eating. Two 2-bite brownies with a mint patty in between. Wrap in foil and warm though on the coals. Cut the end off an orange and scoop out the insides so that the skin is a cup. Fill the cup with prepared cake mix (or muffin mix) and cook above the fire or in a reflector oven. Much like a banana boat, take an ice cream cone and fill it with your choice of marshmallows, bananas, strawberries and/or chocolate chips. Wrap in foil and cook over the coals. Make a mini tin can stove out of a soup can by cutting off both the top and the bottom and cutting some air holes in the sides. Place a tea light candle under the can and a foil tart tin over the top of the can. Then melt some chocolate chips in the tart tin. Dip piece of fruit or small cookies in the chocolate. While you wouldn’t want to drink water with dish soap in it, a drop of dish soap can be an effective way to figure out who boiled water the fastest. The soap will bubble up with the water is boiling clearly demonstrating the wining team. Be sure to review safe fire lighting techniques and make sure all the girls have their hair tied back and are wearing appropriate clothing.